Calm, cool and focused. The SRAM DB5 is required for all bikers who want to tackle ever more difficult terrain, stiffer, harder, without breaking the bank. With DirectLink leverage technology, you will have a feeling of positive braking fingertips, while the large volume reservoir and design 2-piston proven ensure you maximum control. 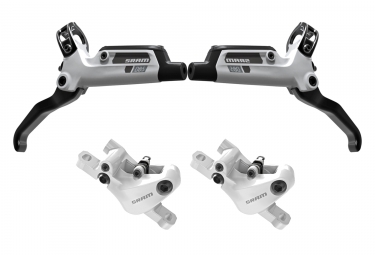 Paire de freins Sram DB5 (sans disque) Organique Blanc clasificado 4.4 de 5 por 5.